No team has shocked the college hoops world by their presence this weekend than Texas Tech. Dudes were sometimes picked to finish last in Big XII pre-season polls. Well, the Red Raiders are gonna finish last, all right. Everyone else in that conference is already in off-season mode. While Tech's been underestimated all season, Michigan State's been everything Tom Izzo's program has featured season after season. Sparty's solid, sound, and would like nothing better than to beat the living snot outta someone. The way sportsbooks see it, this game won't have a winner as much as a survivor. Bovada has set the line at Michigan State -2½, the total at 132, and the moneyline at Texas Tech +130 and Michigan State -150. After losing four starters from the season before, Coach Chris Beard refused to settle for a rebuild. With his intrusive -- ie- handsy and tight -- defensive system and a startlingly effective roster reload, he built a foundation for Tech's best season ever. The Red Raiders also have the Final Four's best player in Jarrett Culver, who's put himself into the lottery pick conversation. If this game comes down to the final possession, as it well might, dude could be the difference-maker. Tech made believers outta talented Michigan and high-powered Gonzaga with their stingy D, which makes their 4-0 SU and 4-0 ATS tourney record all the more impressive. Anyone who's noticed Tom Izzo's temperment can infer that he believes he's got something special this season, and so far, his players haven't disappointed. This roster's as versatile as he's ever coached, and in theory, only Gonzaga's could have been considered better in that regard. Sparty's gonna take the same approach the Zags did, too, by running at every opportunity. The key will be doing what the Bulldogs uncharacteristically did, which is avoid turnovers. If they do, they'll dictate the game. They've got their own clutch playmaker in Cassius Winston. Tech will be challenged to keep him under control. 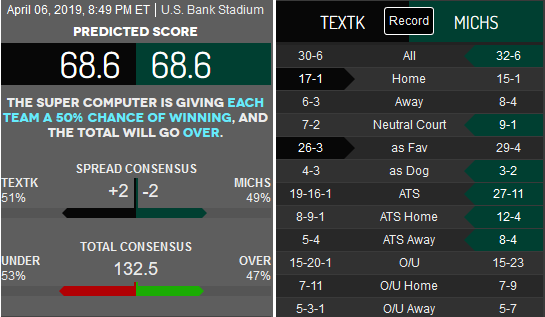 Speaking of impressive records, Michigan State's got a current run of 14-1 SU and 11-4 ATS. The Spartans never panic when down and have shown they can both score uptempo by topping LSU, 80-63, or by slowing it down like they did against Duke. If this game does indeed come down to the final possessions, though, Texas Tech just has a way of creating turnover opportunities where none normally exist. They've been doing it all season, so this isn't a fluke. It may well be the deciding factor.